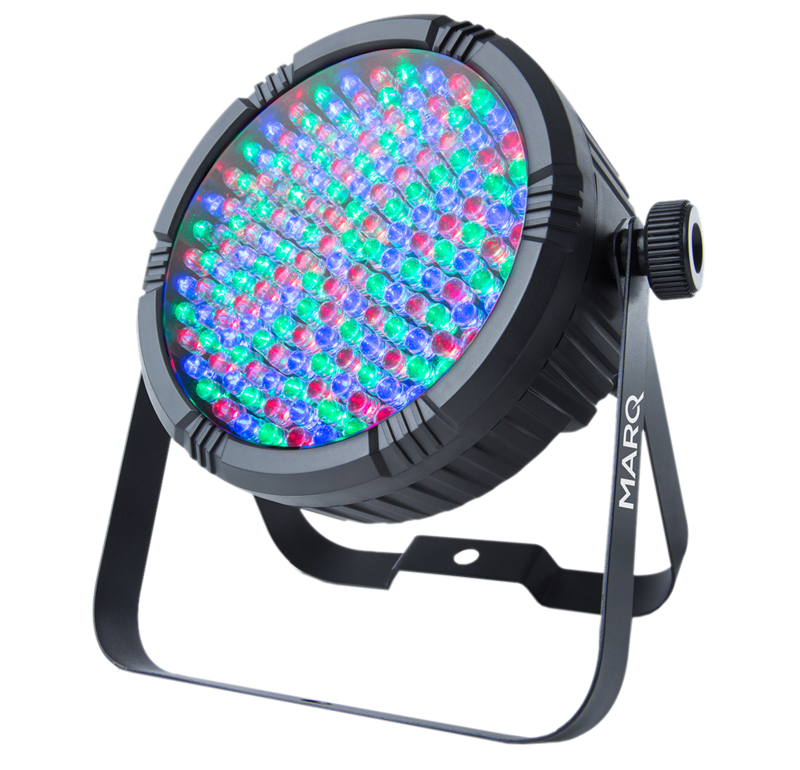 The Marq Lighting Colormax Par Series is a low-profile LED light with LED color technology (RGB) that generates a vibrant spectrum of colors. This guide answers some popular questions about the Marq Colormax Par Series features and functionality. What does the Colormax Series come with? Are there any accessories I can purchase for the Colormax Series? How many LED's do they have of each color? Does the Colormax Series have DMX capability? How do I setup the Colormax Series with a DMX controller? Will the Colormax Series fixtures work with a standard C-Clamp? Where can I find more information about DMX and software? Yes, there is a Colormax Remote that you can use for compatible Marq Lighting Colormax products. Below is a link to the Colormax Remote overview page. There are 3 variations of the Colormax Series, they are listed below with the amount of each colored LED it contains. Yes, they do! They have the traditional DMX IN and DMX OUT ports. This allows you to use these lights with a qualified DMX controller, and with the proper DMX Cables. Connect the DMX cable from the DMX output on the controller you are using, and attach it to the Colormax Series controller. Below is a picture detailing this. Continue running the DMX cable to the Colormax light in your universe. The Powerlink feature lets you link up to multiple Colormax series lights together with power cables (IEC cables). One reason to do this may be if you have a shortage of outlets or power supplies to plug multiple units into. You can then power all of them when having just one Colormax Series connected to a wall outlet. Insert the included power cable into the wall and then the other end into the Marq Lighting Colormax Series fixture. On the opposite power plug on the Marq Lighting Colormax Series, you will see a power jack that works the opposite way. On this jack plug the opposite end of an IEC cable here. Now plug the other end of the power cable into the power jack of another Marq Lighting Colormax Series fixture. This will supply power to the Marq Lighting Colormax Series fixtures. Yes! the Marq Lighting Colormax Series will fit any standard C-clamp on the market, so you can hang this from your lighting fixture or truss. Here are a few helpful links that we have put together, to further assist you with DMX, and our SceniQ Software.